The Canadian Coast Guard said the vessel sunk near Port Mellon on Wednesday. UPDATE — Feb. 2, 2018: A fuel tank on board has been identified as the source of the spill, which has now been contained. The Canadian Coast Guard said the diesel sheen has also been recovered. Diesel was spilled into Howe Sound after a barge sank near Port Mellon, B.C., on Wednesday. The Canadian Coast Guard said it responded with two of its ships after the vessel went down in the early morning. A coast guard statement said the Western Canada Marine Response Corporation, Squamish Nation and provincial officials all responded as well. 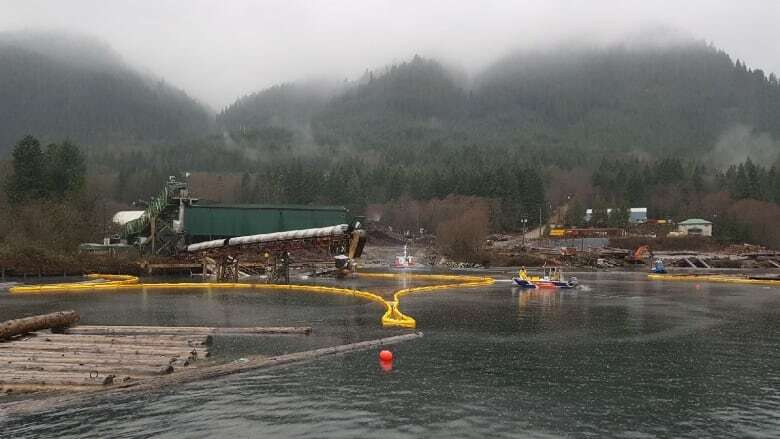 A boom was placed around the spill area, about 17 kilometres north of Gibsons, as crews worked to recover "a surface sheen of diesel" from the water. Help arrives for massive fuel-laden barge stranded near Bella Bella, B.C.